The 2018 TCR Baltic Trophy was awarded in the Aurum 1006Km Race at Palanga, Lithuania. 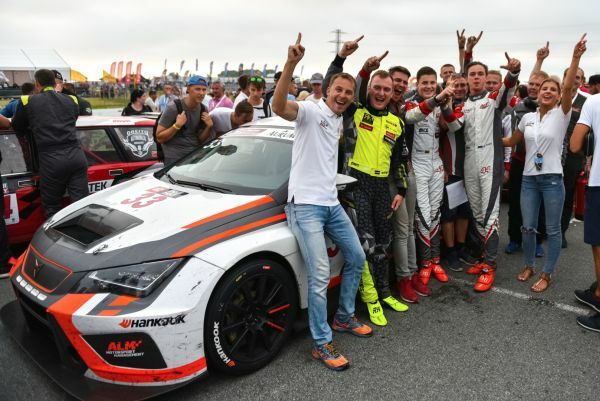 Victory went to the ALM Motorsport Cupra TCR driven by a trio of young drivers who represented the three Baltic countries: Justas Jonušis (16-years old from Lithuania), Robin Vaks (18 from Estonia) and Reinis Nitišs (22 from Latvia). Seven teams competed in the class within a field of 37, and impressed with their performance. Eventually the ALM Motorsport Cupra took fourth place behind three Porsche GTs, the DHL Racing Team Cupra DSG was classified fifth and the London Grill Racing Team Cupra DSG finished eighth. In Qualifying, Dutch driver Kevin Abbring topped the TCR class and set the sixth fastest lap overall, bringing the Hyundai i30 N entered under the banner of the Hegelmann Transporte Group to the Super Pole. The Hyundai led the class for the first half of the race, but with one hour to go it was forced to retire after losing a front wheel. Falkenberg hosts the third race meeting of TCR Scandinavia this weekend. Et les vainqueurs de la Bataille des Ardennes sont Jean-Karl Vernay et Julien Briché !